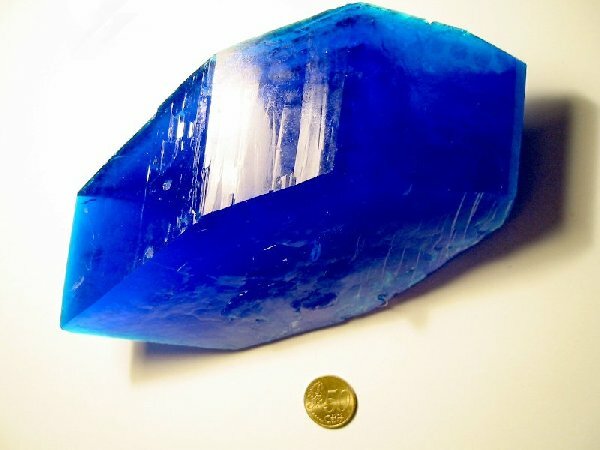 I saw something about this a while ago, and I remember my dad helping me grow this blue crystal when I was little, but how does it work? How could you grow, maybe a CuSO4*H2O for example. How are they actually formed to look so pretty? Is it simply dissolving the substance in a solvent, and then evaporating the solvent? How are they actually formed to look so pretty? Is it simply dissolving the substance in a solvent, and then evaporating the solvent? I've had a few reasonable results with placing a seed crystal in the bottom of a container and evaporating slowly. However, you have to clean it off periodically as smaller crystals will settle into place and intersect, and any movement (of the solution) or contact with the crystal tends to upset growth. Does anyone have a library of crystal habits? That would be as useful as chemical properties in identifying isolated substances. Ah, I see, so just have a crystal for the others to attach to...Hmm, I might give this a try sometime. I found this site to be quite interesting and helpful in making large, single crystals. As an adolescent I aspired to lasting fame, I craved factual certainty, and I thirsted for a meaningful vision of human life -- so I became a scientist. This is like becoming an archbishop so you can meet girls. I did some crystal growing years ago when I was in high school -- kind of a extra credit chemistry project -- in fact my chem teacher gave me the chemicals to grow the crystals from. DrP's comment about hanging a seed crystal on a string is correct -- that will give large, well shaped crystals. Basically you create a saturated solution in boiling water, then let the solution cool to become super-saturated. Then carefully lower the seed crystal into the solution and let everything set undisturbed. If it don't work out right press reset -- i.e. just boil again to get everything disolved and start over. A very good substance to start with is alum, KAl(SO4)2.12H20. This is one of the easier to grow and makes beautiful, clear octahedral crystals. Chrome alum, KCr(SO4)2.12H20 is another good one -- it makes deep violet octrahedral crystals. I did both of these those many years ago. For a really neat effect you can even grow a chrome alum crystal and use it as a seed to grow a clear alum crystal over it -- one of the few cases where a crystal will grow well on a substance other than itself. This leaves you with a perfect violet octahedron inbedded in the center of a clear one. I never got the chance to try that but I have seen pictures. I too did some crystal growing in my time, by the same method mentioned above. I used potassium sodium tartrate. Attached is a picture of the crystal which I dug up out of the lab. Mood: Patience growing thin ! Power comes from the barrel of a gun ! Has to be pure though (impurities prevent the liquid phase from orienting to the crystal, or even nucleate other crystal growth), and done very carefully, since the melting point is sharp. With some servos (for crystal pulling) and a temperature feedback system, I *might* be able to do something like that with my induction heater, when I get it up to power. I've done some crystal growing a long time ago. Evaporation technique/cooling technique depending on the substance. Spent six months growing ammonium alum crystal. Grown Copper Sulphate hydrate, potassium dichromate. Yes, the trick is to get a seed crystal, and then, for even growth, carefully turning them on a regular schedule so that all sides have equal access to the solution. But when I was doing my old science fair project and growing crystals of transitional metal saccharin compounds I did something unusual. Most of the compounds were soluble in water, but sparingly so (except for copper) in acetone. For example, I would make a solution of Zinc Saccharin in water, add acetone until it just started to come out of solution, then warm the mixture enough so that it redissolved. Instant saturated solution. On slow cooling I got some pretty spectacular crystals (meaning up to a quarter inch). The slow evaporation method worked well for most of the other compounds, but this was the only way I got good crystals for zinc saccharin. By the way, I've had a salt crystal growing for more than 30 years! I was in Israel 30 years ago and got a sample of dead sea water and put it into a small jar. I noticed over the years that a crystal formed on the bottom and the volume decreased ever so little... obviously an imperfect seal. So I carefully shake it to turn it over every few years. Now it is like a ship in a bottle (small neck), but there is still plenty of solution left. I just checked, it is about an inch square, 1/4 inch thick and the bottle is about half empty (Probably held only about 3 oz when full.) 30+ years I've had that puppy, tempted to break the bottle to pull it out... nah, just let it go another few years. "For a really neat effect you can even grow a chrome alum crystal and use it as a seed to grow a clear alum crystal over it -- one of the few cases where a crystal will grow well on a substance other than itself. This leaves you with a perfect violet octahedron inbedded in the center of a clear one. I never got the chance to try that but I have seen pictures. " I have done it. Not only that but, if you use shallow trays of the solutions you can grow"rings" of crystals. Grow a small Crhome alum xtal, put it in a tray with staurated aulm and let that grow a layer round the seed. If you only use a shallow layer of solution the crystals grow wider but not a lot thicker. Then you can do the same thing with a dish of chrome alum and get a purple ring and so on. You can also mix chrome alum with ordinary alum and get a range of colours from near black through violets and amathyst to white. Great fun as I recall. I made barium chloride with the carbonate and HCl and sat the mixture off to the side. of a month and made some beautiful crystals that looked like glass in the jar. I just finished making a batch of Ba(OH)2*8H2O crystals. They are nice looking glassine flakes which I dried to dampness using a Buchner funnel sealed to a source of purified air. I'm not going to try to get them any drier as I don't have the required dessicant or a vacuum dessicator. I also tried to grow crystals, took 55 grams of CuSO4 * 5H2O and 100ml of water, heated until all CuSO4 had dissolved and then let it cool. The crystals below are CuSO4 of course, and I have four of them, weighing 1.3 kg each, roughly 20 cm long. They have been growing for 2 years, with the evaporation method. It was a fair bit of work, because the solution had to be filtered frequently (dust, mold), and topped up, while the growth vessel had to be cleaned out regularly. I grew them in a 10 l bucket (yes with 10 l of CuSO4 solution), because the smaller cups/pots I started off with became progressively too small. Currently they aren't growing, put I might pick it up at a later time. The 2nd/3rd crystal are a bit rough on the right edge, because the last time round it evaporated onto the crystal level, making it all mingy and producing this turquoise amorphous stuff. This is not a problem though, I will scrape it off with a knife, wash it with dH2O a bit, to regrow it in CuSO4 once more. Another problem was the nylon thread I used initially - it was too thin and too weak, so the weight eventually ripped it. The current nylon thread takes 9kg, so I still have some leeway. But if you plan big crystals, use the stronger thread from the start, because fixing it later onto a grown smooth crystal (such as the first one) is very difficult, in fact I had to saw into edges a little to fixate the thread. Again, no problem if it is cleaned nicely after that, and regrown. Sadly the quality of the crystal suffered a little from it. However, if you grow it long enough, the crystal layers become so dense you can't ever see the fault. Other than that, they are the proudest pieces of my collection! Mephisto upped those pictures on LambdaSyn, with more details given there (German). Those crystals are truly enormous. I have never seen something like that produced by a non- commercial crystalgrower. Research has really mastered the technique of crystal growing though... I once saw a picture of a 320kg crystal of potassium dihydrogen phosphate. They used a special apparatus, with continuous dissolving of fresh material and circulation of the solution, together with an elaborate system of heaters, coolers and pumps to constantly create a very slightly oversaturated solution in the tank. Those are normally cut into thin slices and used for lasers, for shifting wavelengths. With the interest in crystalgrowing here, I just started a small batch of CuSO4. 40g CuSO4 Pentahydrate in 50ml water, heated until dissolution and left to stand covered overnight. I'll see what has formed in there by tomorrow. 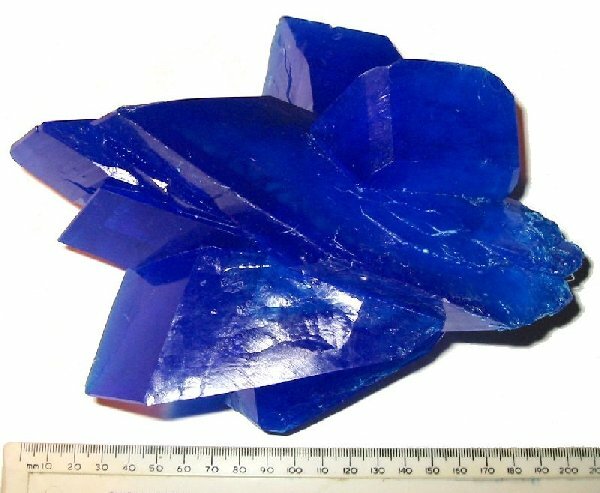 I'm interested in growing crystals with unusual materials. I'll try to create single rhombic crystals of sulfur, by very slow cooling of a saturated solution of sulfur in hot toluene (the evaporation method is not appropriate here, because the solubility of sulfur in toluene at room temperature is too low). Alternatively, I could use CS2 and the evaporation method (though that would have to be done outside due to toxicity). The evaporation would have to be slowed down by a cover over the beaker, the CS2 would evaporate too fast otherwise. I also poured some 45% NaClO3 solution (of which I have several liters) into a shallow plastic dish (evaporation method), because I read that NaClO3 can also be used for growing crystals. A really cool thing would be to hydrothermally grow crystals of quartz. SiO2 is quite soluble in water at temperatures around 300°C, and therefore crystals can be grown in an autoclave. Well thank you. Very interesting what you mention on quartz crystals, I have one sitting right on top of my computer screen, and I always wondered under what conditions it might have formed. I alwyas thought it was formed by melting and cooling, but never could explain why it would, for instance, sit in those globular rock balls - which are cut apart and contain lots of quartz crystals. Now I know - who would have thought SiO2 is soluble in water at 300 deg C ? I gotta get one heavy duty autoclave! Do you have more information on SiO2 crystals, i.e. how they are made commerically? It measures 66 (cm) by 53 by 58. 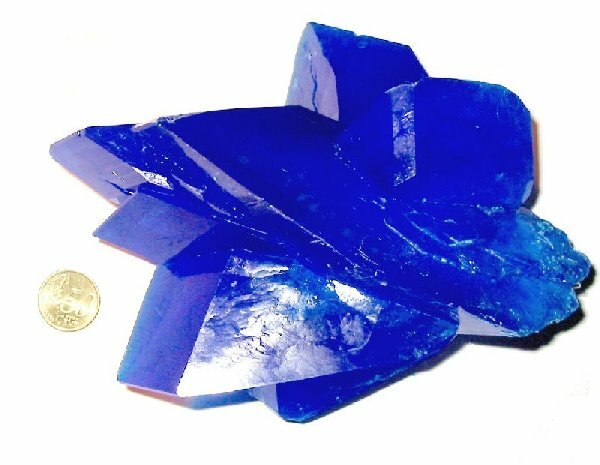 If you ever struggled to grow copper sulphate crystals in a jam jar at school, look enviously at this monster. 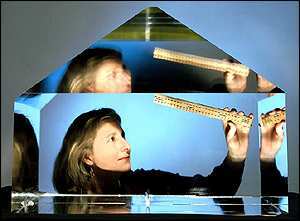 The pyramid-shaped KDP (potassium dihydrogen phosphate) crystal is a record breaker. It weighs in at an astonishing 318 kilograms (701 lbs) - more than 20 kilos heavier than the previous record holder. It was grown in just 52 days by researchers at the US Department of Energy's Lawrence Livermore National Laboratory, California. 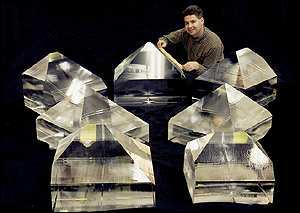 The enormous crystal is to be sliced into plates for use in a giant laser now under construction at Lawrence Livermore. The crystal plates will convert the laser's infrared light beams to ultraviolet light just before the beams strike the laser target. The new equipment will test the safety and reliability of America's nuclear weapons stockpile. The growth technique builds on Russian methods. To grow crystals this big, Lawrence Livermore built on a rapid-growth technique first developed in Russia. A thumbnail-sized seed crystal is placed inside a two-metre-high tank filled with nearly a tonne of supersaturated KDP solution at 65 degrees Celsius (150 degrees Fahrenheit). The temperature is gradually decreased to maintain supersaturation as the growing crystal extracts salt from the solution. The record size of the latest crystal was achieved by giving the solution a transfusion of additional salt through a device called a continuous filtration system, which helps maintain crystal quality. "This technique offers the possibility of producing even larger and higher quality crystals in the future," said Ruth Hawley-Fedder, group leader for the Livermore crystal growing team. "Our newest record holder could have grown even larger, but we simply ran out of room in our growth tank." What I don't quite understand about this technique is how they keep the crystal afloat, there doesn't appear to be a fat nylon cable suspending the crystal. I almost suspect they just place a nice seed crystal at the bottom of the vat, flat side down, and just let it grow. I don't know the crystal space group of KH2PO4, but possibly the bottom side of the crystal isn't what the natural crystal would look like. NaClO3 IIRC forms crystals that are chiral (there are left and right handed versions). Crystals of NaNO3 act like iceland spar and split an image in two. Here is a nice description of the hydrothermal growth process for quartz crystals. Note how the "Low Pressure Process" uses "only" 700- 1000 bar. My attempt at growing large sulfur crystals failed. At first, only monoclinic crystals were formed, very long and very thin needles. I read up and it found that at temperatures of about 95°C, only the monoclinic form of sulfur is stable. So I added more toluene (a total of 65ml for 6g sulfur) to lower the temperature at which sulfur begins to crystallise, and also 1ml of CS2 (I know that slow evaporation of a CS2 solution of sulfur makes rhombic crystals, so I thought that a small amount of CS2 could favor rhombic shape). I used a water bath to heat the hermetically sealed vessel, and let it cool down in the covered water bath (the water bath serves as thermal ballast to slow down the cooling). It actually makes rhombic crystals now, but they are small and there are a lot of them. They also have this very strange behavior to grow into needles with the rhombic crystals on them like a string of pearls. The individual crystals are very good though, a pure yellow and absolutely clear. They also redissolve very slowly, even when the toluene is hot enough to allow complete dissolution. The crystalline sulfur would look great as an element sample, much nicer than the powder one always sees.